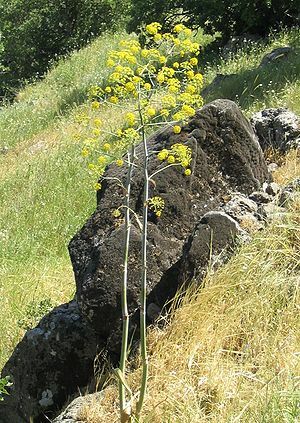 Ferula communis, photographed in Israel. Ferula means "rod" in Latin. Ferula is also the genus of about 170 species of flowering plants in the family Apiaceae, native to the Mediterranean region east to central Asia, mostly growing in arid climates. The Romans used the hollow light rod made from this plant for various purposes: for walking sticks, splints, for stirring boiling liquids, and for corporal punishment. So the term ferula could refer to various things, including a rod for chastisement. The birch rod however was not called "ferula" but "virga". Ferule is the anglicized word derived from Ferula. Sometimes "Ferula" is also used in English to refer to a variety of spanking implements, including straps. Many plants of the Ferula genus, especially F. communis, are referred to as giant fennel, although they are not fennel in the strict sense. This page uses content from Wikipedia. The original article was at Ferula. The list of authors can be seen in the page history. As with Spanking Art, the text of Wikipedia is available under a copyleft license, the Creative Commons Attribution Sharealike license.